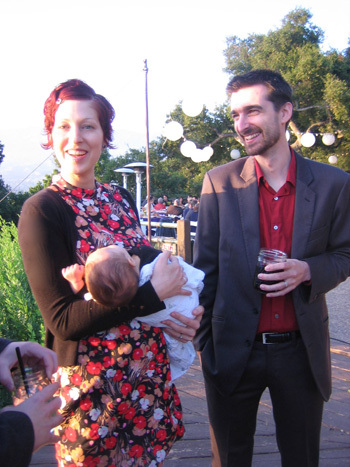 Two of my favoritest people on the planet recently married each other. I love it when that happens! It was a gorgeous afternoon, sunny and warm with a mild ocean breeze. An easy evening full of friends and laughter, and music late into the night. Thank you Tommy and Kelly. And mazel tov! 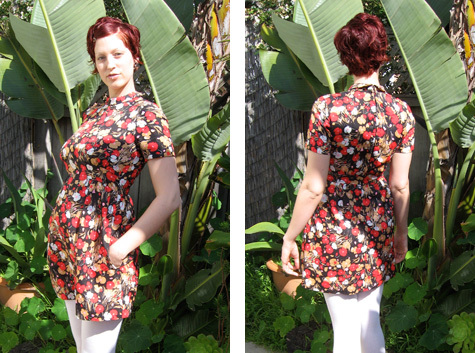 Vintage Minidress: secondhand, and it’s handmade! Waits wore his own little wedding number. 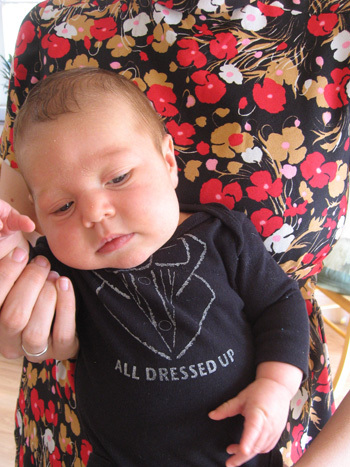 In case you can’t tell, that’s an ‘All Dressed Up’ tux onesie. He also had matching black booties, not pictured. He’s already got mad style, eh? Pictures of other people at the wedding would be nice. Also, a special shout out to the bride and groom for selecting vegetarian fare for the wedding feast. It wasn’t vegan, but it was still forward-looking. I LOVE the minidress. 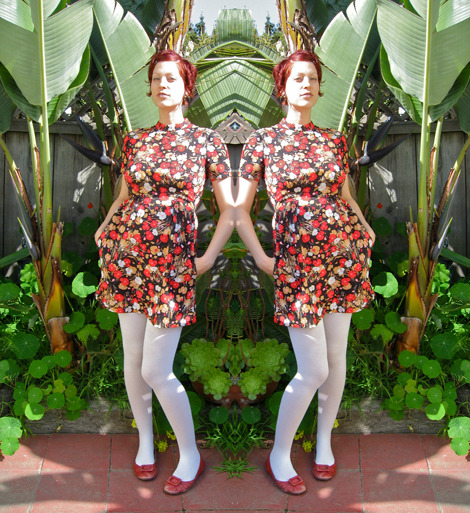 Makes me want to breakout the sewing machine again and get sewing. So much to do right now… Meanwhile my hubby is making is own root beer, hehe. BTW, I loved your post on Henna, and hubby and I have decided to try it, too. He’s a photographer, so I will let you know when we get the nice pics up. First I have to hunt for the henna goods at a cheap price. awwwww….you look so happy! and Waits…oh my goodness! luvbugg! You guys look absolutely gorgeous. Looks like Waits is not that into weddings! You all look so great. And your baby is super cute. You look like such a happy family! I love the dress and tights. Damian is definitely styling too :-) I hope you had fun and Congratulations to the Bride and groom. Awww, the way your hubby is looking at you in that top pic is PRICELESS!!! Double congratulations! Seems like things are going really well for you! I’m not visiting your blog as much as I probably should these days, so sorry about that! I thought to come here today to use this space to drop a link to ya, since I don’t know any other way to get ahold of you. 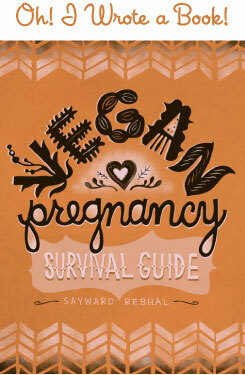 :) I saw this Make article and thought of you and your lovely hen. I don’t know where your hen is living these days, but this looked like a pretty awesome chicken-house. Enjoy! 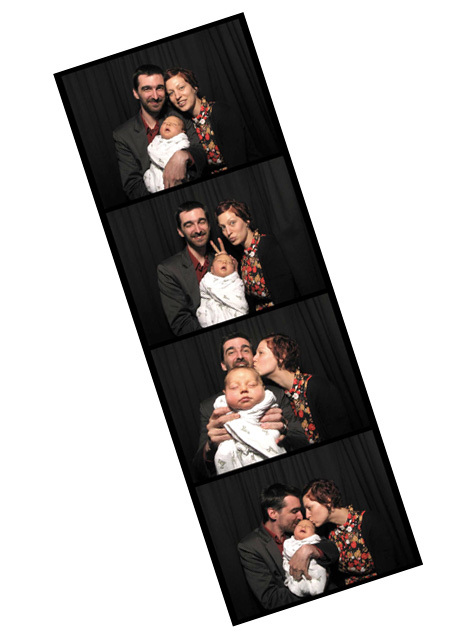 @ Minna – Never been in a photobooth?! Darling, you must do it, it’s so much fun! But about the hair . . . no, not henna. I’m back on Manic Panic now that Waits is out. What can I say, I gotta be bright! It’s actually the same as this color, but I’m just not bleaching first. @ Awol – Great link, thanks. Those hen houses are so inspiring!